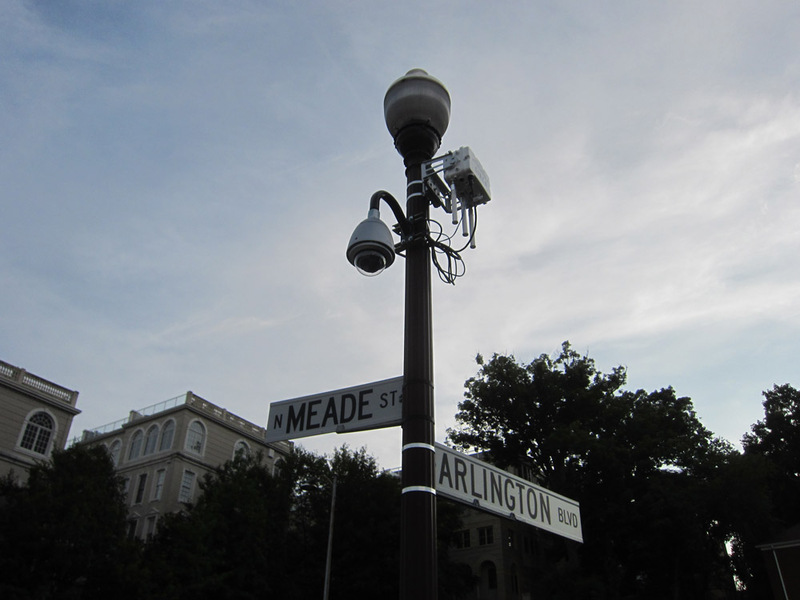 A new surveillance camera has been installed in Rosslyn at the corner of N. Meade St. and Arlington Blvd. The camera is similar to the one recently installed along Rt. 50 near the Westmoreland Pedestrian Overpass. The new camera is connected to a Cisco box with three long cyclinders protruding from the bottom. The Ode Street Tribune's investigative journalist speculates that those cylinders are antennae, and that the surveillance camera relays real-time video to a secret location. The new surveillance camera is located next to the lush Meade St. Park and undoubtedly has a majestic vista of the Potomac River. New technology like this spy camera can help people all around the world experience the beauty and dynamism of Rosslyn, The Tribune calls upon the secret agencies running this surveillance camera to make the video feed freely viewable by the many persons around the world eager to get a view of Rosslyn.